If you are in the UK and have a TV licence, the following events from the Winter Olympics 2018 are available on BBC iPlayer and online for free. Plus 40 other episodes. If you want to have access to all the broadcasted content available at the Olympics, you will have to go through Eurosport and TVPlayer. See below. With the 2018 Winter Olympics now reaching its climax, Team GB has officially enjoyed its most successful games ever. Billy Morgan's bronze in the snowboard big air means that Pyeongchang 2018 has been a major success, bringing the total to five medals. More than 2,500 athletes from 90 nations are battling it out in Pyeongchang to take home a medal, with plenty still left to play for. 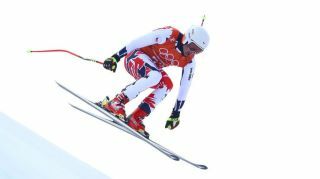 The action is turning the Winter Olympics 2018 into one of the most-watched sports broadcasts of the year, with over one billion viewers are expected to tune into this year's Winter Games, which last until February 25. Whether you want to stream the Winter Olympics 2018 online, watch it live on your television via cable or watch it mostly without the constant interruption of commercial breaks - we've got you covered. Here's the entire schedule of the Winter Olympics 2018 and the 2018 Winter Olympics medal table. If you're excited to experience all the drama and excitement at the Games, just be aware that there's a nine-hour time difference between PyeongChang and London, and a 17-hour difference with Los Angeles. Here is TechRadar's quick and easy guide for how to watch the Winter Olympics 2018 (or PyeongChang 2018 as some call it) online from anywhere in the world! Youtube and the Olympics committee have put together some compelling short videos on some of the lesser known sports (think Curling or Biathlon). You can watch them straight from Youtube on the official Olympics Youtube channel not to be confused with the Olympics channel. Sadly some of the videos (e.g. this playlist) are not currently available in the UK which means you might need to use a VPN to access them. See how to do that below. Simply open the VPN app, hit 'choose location' and select the appropriate location - it doesn't matter which one and it's super easy to do. TVPlayer is a free, legal, online streaming service based in the UK which offers hundreds of channels - and you don't even need to sign in to get some Olympics coverage without commercial break. You will need to do a fair bit of channel hopping though and a lot of the events won't be available on free channels. Continue scrolling if you want to experience a fuller and richer version of the Winter Olympics. Many online US-based TV streaming services offer NBC Sports as part of their bundles and a few of them offer trials and the best one is YoutubeTV, an official Google product. You can trial it for 30 days; the ability to record to the cloud and hold up to six accounts per household (and 3 simultaneous streams per membership) are its most alluring selling points. You can watch it on most devices and there are no fees for canceling. However, you will need a US IP address in order to access all of the above and if you are outside the US, you will need to get an IP address located there by using a VPN. Where can I watch the Winter Olympics 2018 using a VPN? A VPN will enable you to watch the Winter Oympics from literally anywhere. So that obviously includes: US, UK, Israel, Belgium, Canada, Germany, Denmark, India, Netherlands, Spain, Brazil, Belgium, Romania, Mexico, France, Sweden, Italy, Portugal, Czech Republic, Ireland, Poland, Kenya, Hungary, South Africa, Indonesia, China, Nigeria, Bangladesh, Russia, Japan, Egypt and more! Google has also confirmed that it will be playing video highlights from official Olympic broadcasters on Youtube in more than 80 countries worldwide including NBCUniversal (USA), BBC (UK), NHK (Japan), France TV (France), and Eurosport (Rest of Europe). In the U.S., YouTube TV will also show NBCUniversal’s live coverage of the Olympic Winter Games and in India, Pakistan, Bangladesh, Sri Lanka, Bhutan, Maldives and Nepal, the Winter Olympic games will be for the first time live and free on the Olympic Channel on YouTube. Good news! If you are in the US, that’s straight forward, NBC will broadcast the XXIII Winter Olympics on its website and through its NBC Sports app for free (Android, iOS, Windows, Roku, Chromecast, Xbox, Samsung, Amazon Fire TV). While you can watch Olympics coverage online through NBC, the network is only offering users full live stream and replay access for 30 minutes. Once this time expires, users will have to enter their cable provider information to keep watching. If you’re in the UK and if you have a TV licence, then BBC iPlayer is where you should go for Winter Olympics 2018 as the official broadcaster for the games; you may be asked to register for free in order to watch it though but it is a doddle and once you do it, you can enjoy it almost anywhere. : on your mobile, your media player, tablet, your web browser, streaming device, gaming console, TV, cable and satellite operators etc. Just note that the BBC will not cover ALL the events - just a selection of them - and while you can record locally on your PVR, you won't be able to record to the cloud. However, if you want to get the full Olympian experience, you will need to get a specialist channel like Eurosport, which is the global official broadcaster for the Olympics. You will be able to get all the live action on Eurosport for as little as £3 with 7-day catchup and the ability to record live programs to the cloud to watch whenever you want. You will need to use the code OLYMPICS50 when signing up and you can cancel after the first month. Otherwise you will be auto-enrolled on a subscription. During the Winter Olympics, watch all the live action on Eurosport and access 30+ other premium channels for £3 for a month. Get every event live, 7-day catch-up, record live programs to the cloud to watch when you want. The Winter Olympics 2018 are being shown in virtual reality (VR), the first-time ever for the Winter Games. A mix of live and video-on-demand content is available – all you need is a VR headset and an app to tune into the action. Intel, the Olympic Games' official VR Experience Partner, has partnered with the Olympic Broadcast Services to capture 30 events and more than 50 hours of live coverage of the Olympics. Users in the US can watch the spectacle through the dedicated NBC Sports VR app, available for iOS, Android and in the Oculus and Microsoft stores. Users in Europe (except Germany and Italy) can use the Winter Olympics Eurosport VR app, available for iOS and Android. Outside of these broadcasters, users will find Olympics VR content available through CBC (Canada), Radio Canada (Canada), NHK (Japan), ZDF (Germany), SBS (Korea), CCTV (China), AMX (Latin America) and OCS (global). NBC has created a schedule of the content it will have available in VR, which you can view at NBCOlympics.com. Events shown in VR include alpine skiing, curling, snowboarding, figure skating and ski jumping.